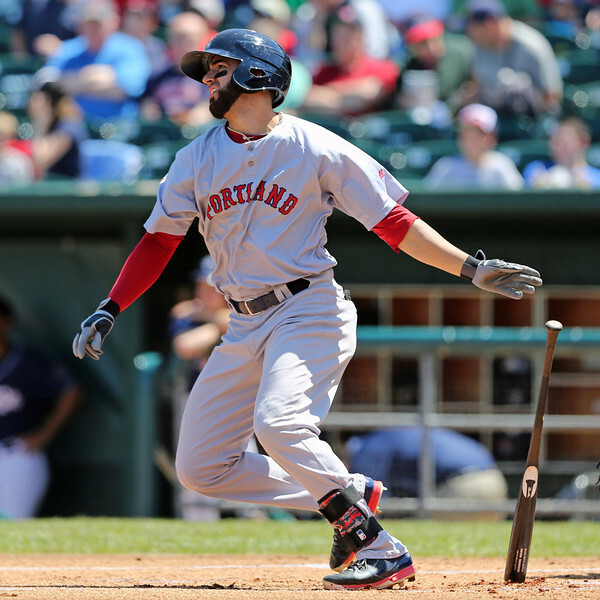 Shortstop Deven Marrero (pictured) and right-hander Miguel Celestino have been promoted from Double-A Portland to Triple-A Pawtucket, the PawSox announced Wednesday. Marrero, 23, was the organization's top pick in the 2012 draft. Known for his glove and athleticism, Marrero has impressed with the bat this season; he's produced a .291 batting average and .804 OPS in 268 at-bats for Portland. In addition to a higher batting average -- he hit .252 in 404 at-bats in between levels in 2013 -- Marrero has flashed more power this season; he's slugged .433 with 19 doubles, two triples and five home runs. Celestino, 24, is a 6-foot-6 right-hander from the Dominican Republic. In 2014, his second season in Portland, Celestino appeared in 23 games as a reliever; he posted 34 strikeouts and a 3.07 ERA in 29 1/3 innings pitched. He's held batters to a .229 batting average, and has demonstrated the ability to get out both right-handers and left-handers. The organization has made two countermoves: right-hander Jeremy Kehrt, 28, has been moved from Pawtucket to Portland and Pawtucket catcher Jayson Hernandez is headed to the disabled list. Additionally, the organization has made three other transactions: Portland has placed Keith Couch, a right-handed pitcher, on the disabled list; Pete Ruiz, a right-handed reliever, has been called up to Portland from the Greenville Drive; and third baseman Michael Almanzar, recently reacquired from Baltimore, is headed to Portland. Photo Credit: Deven Marrero by Kelly O'Connor.